Paul started studying guitar and music at the age of 11. He started his formal training after high school and studied with some of the best in the area. His instructors include Brian Pardo, Danny Caron, and most recently Richard Savino. Paul also has been trained as a bassist, both electric and double bass. His instructors include Shahien Shahkar and Rashid Alta. He is currently finishing a degree in composition at California State University at Sacramento, under the instruction of Leo Eylar. Paul also has a great deal of experience in performance. He has played in many big bands, orchestras and jazz combos. He was the staff bassist for North Hills Christian Church for 15 years and the staff bassist for Listen and Be Heard Poetry Cafe for 2 years. 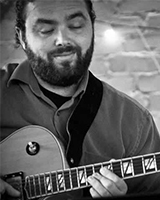 He is currently the guitarist for the Steven Logateta Big Band.